What you're seeing is a 12" embroidery hoop mounted on an embroidery stand, for 2 handed stitching. What? there seems to be a big balack blob on my work? well that's because what I'm embroidering is a SECRET sillyface! I'm crafting for the craftster Doctor Who swap at the moment and I don't want to spoil my partner's surprise! Anyhow the video explains everything I did differently to Very Purple Person ...please let me know if you use my applique templates, I'd love to see what you make!! 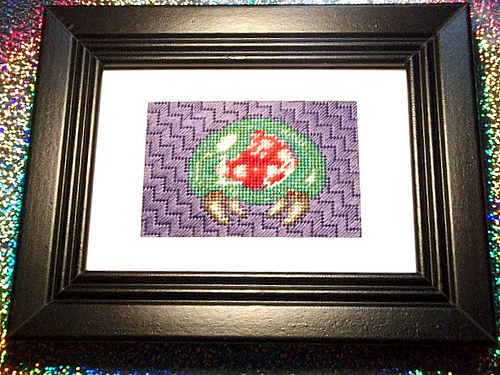 It's clear that the juxtaposition between technology and ancient crafts is pleasing, and rendering your favourite sprite in cross-stich is a great way to impress fellow like-minded geeks! Unfortunately OneChordWonder's etsy shop is out of commission at the moment, but I've collected together a bunch of other ways for you to get your blocky fix. Got a massive wall to spare? why not paint it in metallic paint and enter the world of pixels XL. I completely want this stuff... it's basically just magnets... magnets of pixelly goodness...plaster your sitting room with geek-joy OH-YEAH! remember, we're like-minded geeks, and we want to be impressed! so make sure you let us know about any geek crafting you've been doing recently, is pixel art old news? or timeless? let us know! Wanna see something really cute? I picked up both free from a car-boot seller who wanted to go home, the jumper was ruined because someone had tumble dried it, it was supposed to be size 10 but looked like it would only fit a 3 year old. Not Dabbling In Normal did a great tutorial on turning a sweater/jumper into a bag, ages and AGES ago my artsy friend Catie suggested the link to me on facebook. To line the bag I consulted Very Purple Person's reversible bag tutorial... clearly I didn't use the pattern... and it's a bit wasted because it's not a reversible bag... but it's a good way to line a bag. And oh-so-cute bow was crafted out of the turtle neck collar from the original jumper using the Parisienne bow technique which I fist discovered on Burdastyle, but now have etched into the back of my sewing brain. but enough talk, more pictures!!! I'm in the middle of re purposing an old jumper and I unpicked the seam so I could use this tag in the final piece... then I noticed the 'cut here' dotted line, usually obscured in the seam allowance. ... but you know, it gives more importance to what I do, upcycling clothing. How disrespectful would it be to throw these people's hard work in the bin just because of our whims of fashion..... The only thing that is worse than the conditions people work in to bring us inexpensive clothing is how it has distanced us from the work. So many of us consume fashion but most of us have no idea what goes into crafting a garment. It's such a shame.